A heartwarming story of lost and found reunion of three leopard cubs with their mother played out at the Rangagora Tea Estate recently. The reunion was orchestrated by Wildlife Trust of India’s (WTI) Mobile Veterinary Service Eastern Assam (MVS-EA) team attached to CWRC (the Centre for Wildlife Rehabilitation and Conservation – IFAW-WTI and the Assam Forest Department’s wildlife rescue, treatment and rehabilitation facility near Kaziranga National Park. 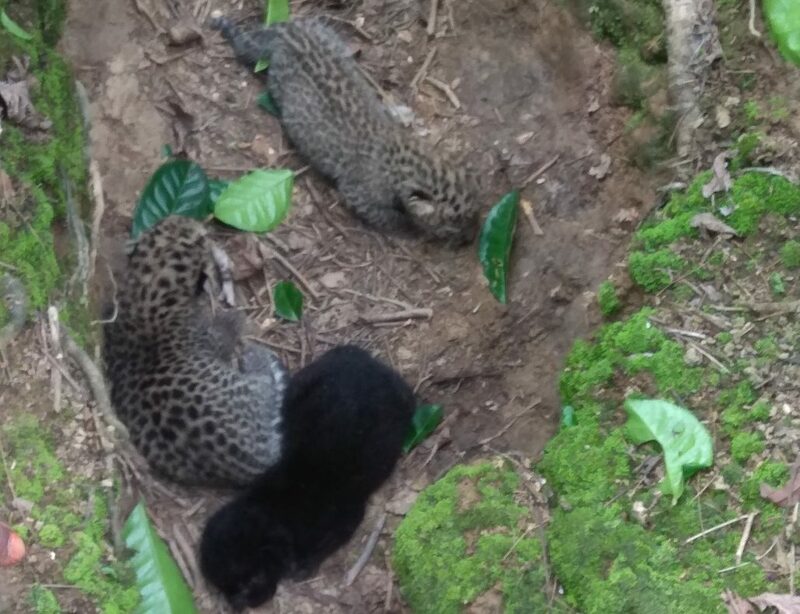 The ordeal for the cubs, less than two weeks old, started when the MVS-EA team received a call on the morning of 12 May that three leopard cubs, one of them melanistic, had been spotted inside a trench in the Rangagora Tea Estate by tea garden workers while carrying out their regular activities. The workers also reported that they had been regularly sighting an adult leopard in that region, presumably the mother leopard. After rushing to the spot, the team led by Dr. Santosh Kumar Gupta, Veterinary Surgeon, WTI, MVS-EA decided to isolate the area and restrict the movement of people to provide the mother leopard, which was expected to be in the vicinity, the opportunity to retrieve her cubs and move them to a safer place. As the news of the leopard cubs spread rapidly through the morning, Assam Forest Department staff, along with few locals from the village, manned the entrance gate of the tea garden to ensure crowd control and keep at bay the huge number of curious onlookers – who were eager to get a glimpse of the cubs and click photographs. The area was completely isolated and the IFAW- WTI MVS-EA team waited patiently at a distance to allow the mother leopard to retrieve her cubs. After about five hours of waiting, the team visited the spot and was relieved to find that only one cub was left, indicating that the mother leopard was in the process of picking up her cubs, as was evident from fresh pug marks of an adult leopard. Knowing that the mother leopard would prefer the cover of darkness to complete the retrieval process and fearing that she may abandon the last cub if she was disturbed by frequent visits to the spot, the team decided to completely isolate the area from all human disturbances and return the next morning to check the status.